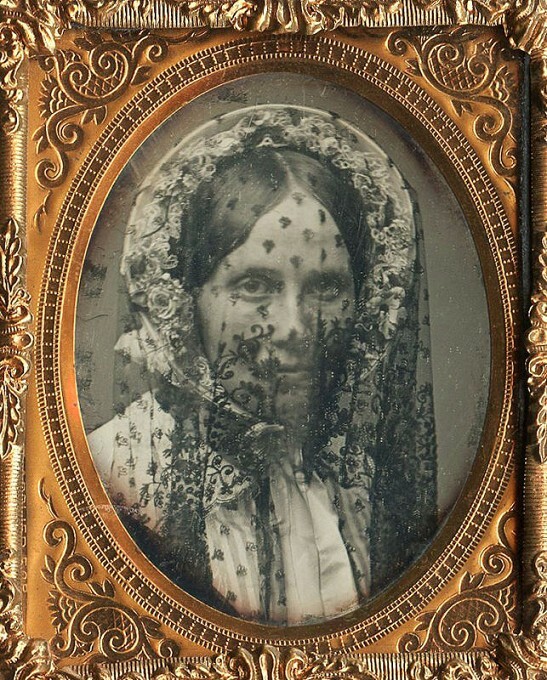 Veils were a common fashion item in the Mid-19th C. This looks like very expensive lace on a lavishly trimmed bonnet. You generally don't notice them in period images because they drapped off the back of the bonnet. They affixed to the crown so they are hidden behind the brim. Black was not the only colour used in mourning clothing it started deep black for first mourning then lightened over time. Gray and purples/lavendars would be used. I own one late mourning garment that is very faint (near white) gray spotted in lavendar. I hope this helps you view this image :) It's wonderful!